A dear little common plant, from six to fifteen inches high, with several slender, branching, hairy stems, and soft, hairy, gray-green leaves, the upper ones small and narrow, without leaf-stalks and the lower ones sometimes with two or three lobes and with leaf-stalks. 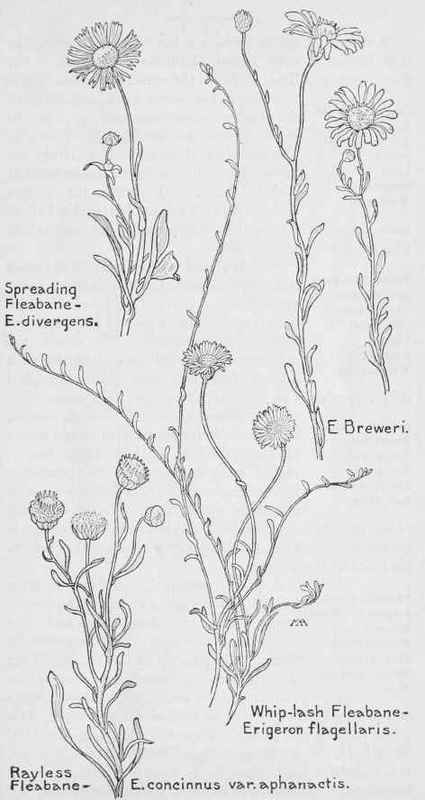 The flower-heads, several or many, on slender flower-stalks, measure nearly an inch across in spring, but are smaller in summer, and have numerous very narrow rays, white towards the center, shading to bright violet or pink at the tips, with a bright yellow center. This often grows in quantities on dry plains and mountain-sides, as far east as Texas, and is quite charming, the tufts of foliage, dotted with pretty delicate little flowers, not touching each other, but sprinkled over a large space, recalling the little flowers in early Italian pictures. E. puniilis, of the Northwest and Utah, is much the same, with white rays.